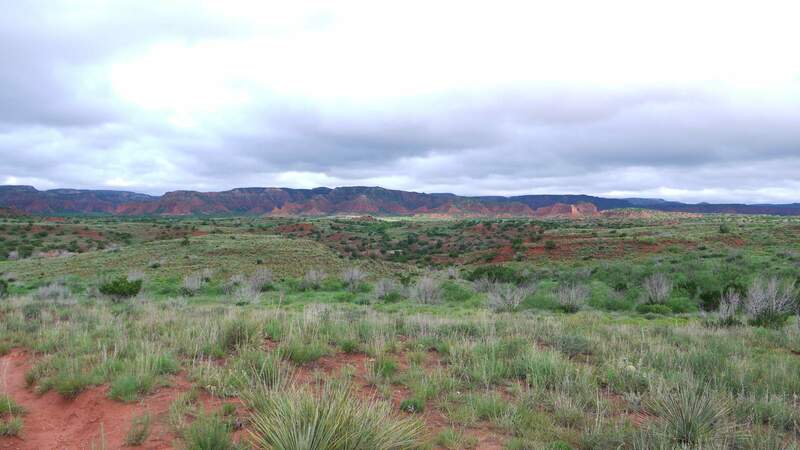 Caprock Canyon State Park is located about 100 miles southeast of Amarillo, TX or 110 miles northeast of Lubbock, TX. Everything is bigger in Texas, that applies also to the distances you need to travel. Caprock Canyon is pretty much in between Amarillo and Lubbock in Texas and about an hour drive from Interstate 27 on Hwy 86. The park has 35 campsites with water and electricity, 9 water only campsites and about 80 walk in or hike in primitive tent only sites. We stayed only one night in a water and electricity campsite in the Honey Flat Area. Our site was a back-in site with plenty of space for the Sprinter. Other than the power connection and the water faucet it also had a nice, shaded picnic table and a fire ring (like all other sites in the Honey Flat Area). This was so far the only time we used the roof top A/C unit (it was over 100F) and there was a massive thunderstorm overnight. The Facilities were in good shape but not as clean which was probably because the Honey Flat Area was pretty full with campers. The water for the showers was hot, which in my book is one of the most important things when you’re staying in a state park. There are 90 miles of trails and we didn’t have time to hike them. The scenery of the park is absolutely gorgeous, so we’re planning to come back and I will update this section after our second visit. 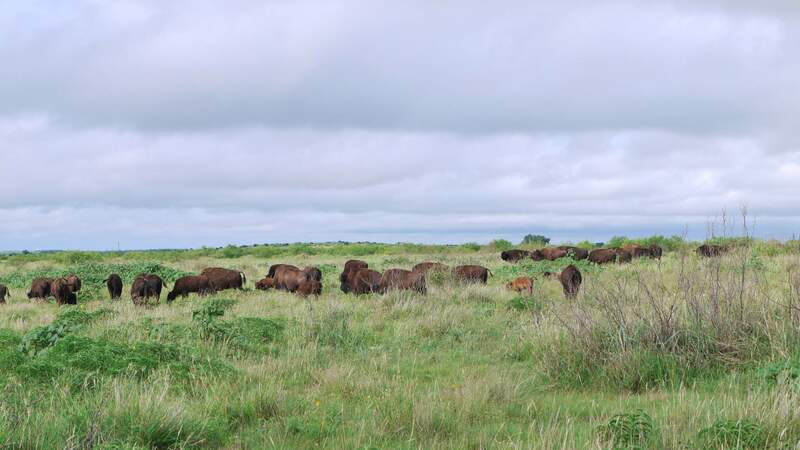 At least we had some time on the way out to take a (careful) look at the official bison herd of the State of Texas. 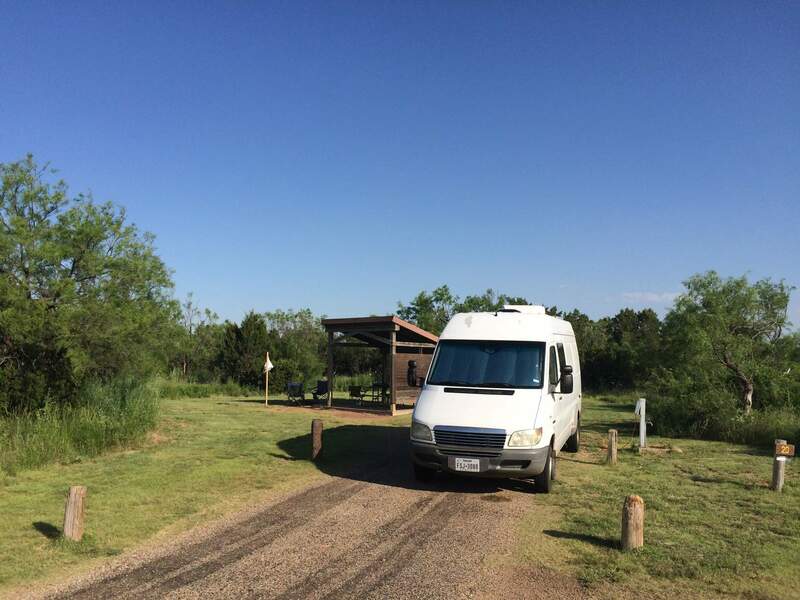 Campsites with power and water are between $15 and $20 per night. Water only campsites are $14. The Entrance fee to the park is $4 per adult.